It is the only cave in Hungary, which can be visited on boats. The cave was discovered during digging a well in 1903, its passages in the 13,7 million year old rock were created by the emerging thermal water. In the dry section of the cave halls of a size of small rooms can be seen. A 200 m long part of the water section, which can be visited on boats in a circular way, are lit with underwater lights. The temperature of the water is 18-20°C, the rowing part of the water is 70-120cm, the air temperature is 20 °C throughout the whole year. Arriving at the cave, you can see how the 6-8m high walls and the ceiling of the Lóczy-hall were washed by the water, which formerly filled the cave. Similar traces can be found on the walls of the corridors which get broader at places to form halls. 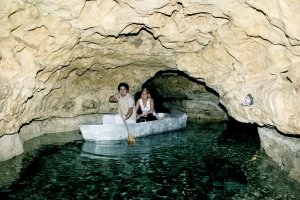 Boating is possible in the cave due to the swelling of the brook Tapolca. It takes 20 minutes to make the underground boat trip. Some of the lights illuminating the narrow and broad passages were placed under the water, so watchful visitors can even see the only fish species living in the cave, the minnow. Publications, souvenirs are available on the premises. The rare natural attraction can be visited wearing casual clothes, with professional guidance.